A couple of years ago, I didn’t even know chilaquiles existed – I know. But that all changed when some friends of ours made us some for dinner one evening and the flavor and simplicity of the dish blew me away. I’ve been itching to veganize it ever since. The base for this dish is a hearty 5-ingredient sauce, which comes together fast and is not only flavorful, but also incredibly versatile. While it’s perfect in this dish, I also suspect it would be amazing on enchiladas, tofu scrambles, and more. I can’t wait to experiment with other uses. 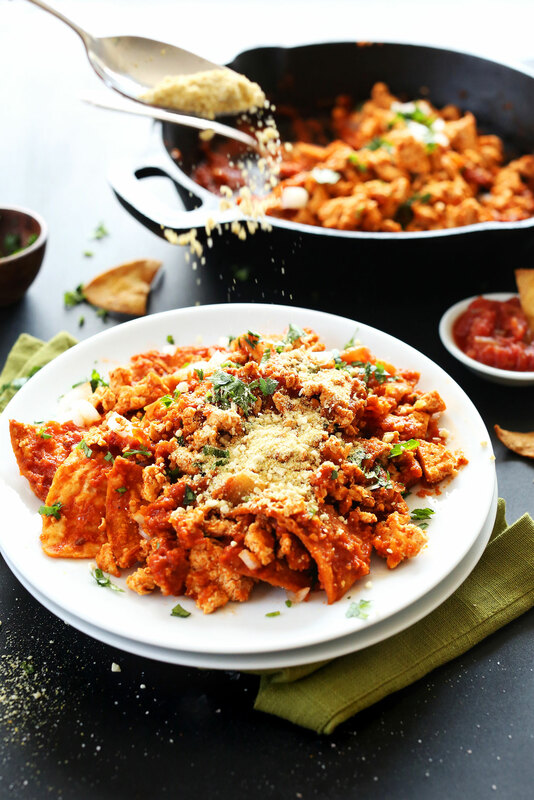 Traditional chilaquiles recipes typically involve chips or fried tortilla strips, stir fried in a rich tomato sauce and topped with chicken, eggs and cheese. But this version remains vegan friendly yet still amazingly flavorful. Plus, it’s considerably healthier thanks to DIY baked tortilla chips. This dish only takes 30 minutes to prepare, and is super satisfying with 16 grams of protein per serving. I love it for breakfast, but it would also make the perfect brunch or even weeknight dinner. John and I attempted to split this skillet for lunch and couldn’t even finish it all! It was so filling and fresh and most importantly, husband-approved. Top this dish with some fresh cilantro, onion and Vegan Mexican “Parmesan” Cheese for another wave of freshness and flavor. In my opinion, this step is a must. I think you guys are going to LOVE this dish. If you give it a try, be sure to take a picture and tag it #minimalistbaker on Instagram or @minimalistbaker on Twitter so we can see! We love seeing what you guys cook up. Alternatively, Pin it to save for later. Cheers! 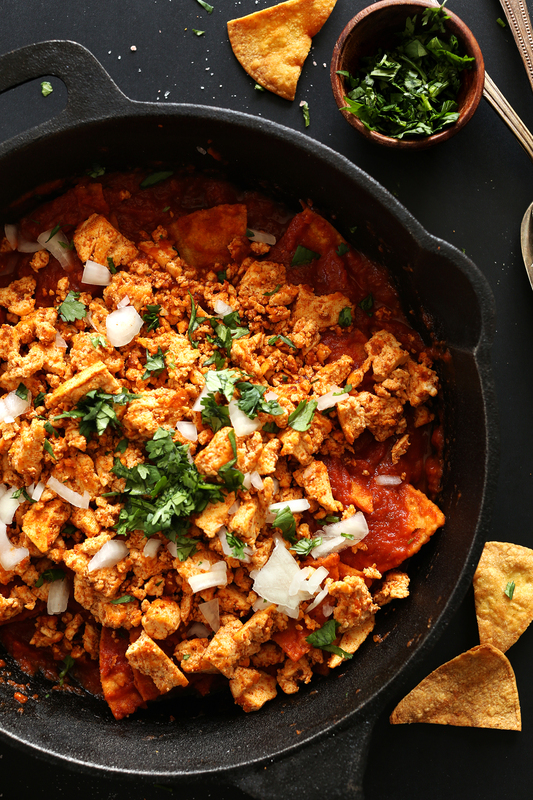 30-minute Vegan Chilaquiles with 5-ingredient chipotle sauce, DIY baked chips, and a hearty tofu scramble on top! Flavorful, fast and seriously satisfying. Start by quickly pressing/draining your tofu in a clean kitchen towel with a heavy pot on top, and preheating oven to 350 degrees F (176 C). IF BAKING YOUR OWN TORTILLAS: Lightly brush or spray both sides of your tortillas with olive or avocado oil and lightly dust them with sea salt. Stack and cut into triangles and arrange in a single layer on a large baking sheet. Bake for 10-12 minutes, flipping once halfway through, until crisp and just slightly golden brown. Set aside. If using regular chips, skip this step. While chips are baking, heat a large skillet over medium heat and prep onion and garlic. Once hot, add 1 Tbsp olive or avocado oil (amount as original recipe is written // adjust if altering batch size) and onion. Cook, stirring frequently, until soft and slightly browned - 3 minutes. Then add garlic and cook for 1-2 minutes more. Add tomato sauce, diced chipotle and adobo sauce, and veggie stock. Heat until bubbly. Then reduce heat to low and simmer for 5 minutes. Transfer sauce to a blender (optional). For a completely smooth sauce, blend well. For a chunkier sauce, pulse and leave some texture. Set aside. Use a fork to crumble the tofu and place skillet back over medium heat (no need to rinse or wipe clean - the remaining sauce adds more flavor). Add a bit of oil to the pan and then add tofu. Let lightly brown for 3-4 minutes, stirring once or twice. Then add seasonings (chili powder, salt, garlic powder and cumin) and stir. Cook for another 2 minutes, then remove from pan and set aside. Add chips to the pan and pour over sauce, stirring quickly to coat. Then top with tofu scramble, fresh onion, and cilantro and serve immediately. Additional toppings might include hot sauce, lime juice, salsa and/or Vegan Mexican Cheese. Serves 2-3 as original recipe is written. Best when fresh. *You can sub 2 large handfuls of tortilla chips in place of 5 tortillas. *Nutrition information is a rough estimate calculated without any additional toppings (cheese or otherwise). SO GOOD! i wouldn’t shut up about how much i loved this … and we ate it ALL… <3 thank you! 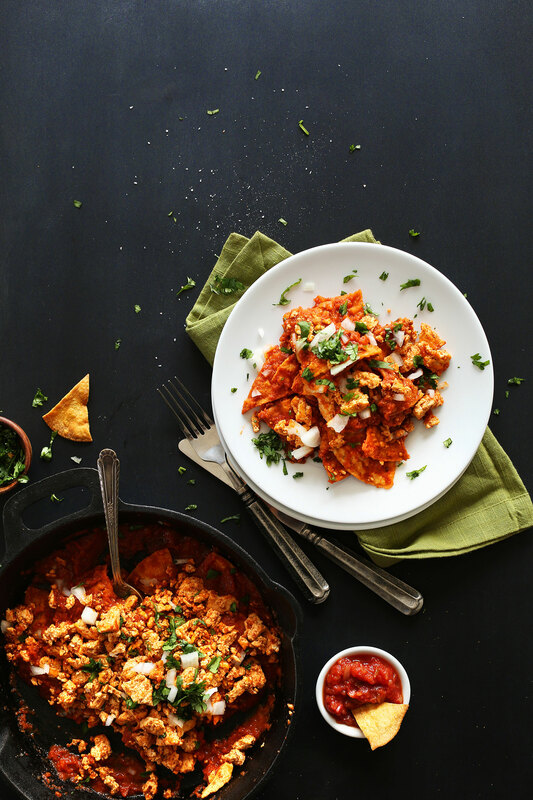 I’ve never heard of Chilaquiles bit this is a great recipe! I’ve now made it twice in two days (and had the leftovers for lunch). The second time I added spinach and kale to the sauce for extra nutrition, and I used the chips like a dip (so they weren’t soggy). This turned out really delicious! Made it with the store bought minced tofu And was really surprised that it had no bad tofu smell :) Also did my own adobo sauce by mixing together 2 chillies, half of garlic, tbsp of water, tsp of Apple vinegar, pinch of salt And tsp of ground cumin – do not know if It was similar to the original but it was delicious . Will be making these again for sure! Thanks for sharing! I’m usually a green sauce person when I make chilaquiles but I just made this chipotle sauce and it was so yummy! Probably my favorite chilaquiles I’ve had! The flavor was delicious! I topped mine with fresh cilantro and I feel like it just brought all the flavors together :) thank you for this recipe will definitely be making again! I made these tonight and wow they were so delicious!! I followed the recipe pretty closely. I didn’t blend up the sauce because it looked so good after it was done simmering and I liked being able to see the onion pieces. I topped mine with cilantro, onion, a squeeze of lime juice, avocado, and a dallop of vegan sour cream—PERFECTION!! So, I made this for dinner, and I was really excited while making it. While eating it, I was a little disappointed. The recipe turned out very sweet and barely spicy (though admittedly I love spice). It’s definitely more suited for breakfast than dinner, in my opinion. The tofu dominated in a way I didn’t really like. That being said, I should have pressed out more liquid beforehand. Additionally, I tried to make the home-made chips, but the tortillas were so thick it took forever for them to crisp up suitably in the oven. I’m not thrilled with it, but I will try it again with modifications. I’m not really into crunchy food, so I think I would prefer it sans chips, served with rice and black beans (but I’m Cuban, so everything sounds good with rice and black beans). Made this tonight. Excellent flavor! Ok girlie, this was so good! I made this in the dark last night during Earth Hour lol! This looks great! I just realized that I’m out of tofu. I have tempeh though – do you think that tempeh could work in place of tofu? Hi Amanda! We haven’t tried using tempeh but I think it could work. If you give it a try, report back on how it goes! You might as well make a double batch! I use 2 blocks of tofu & double the measurements for the sauce. We eat half immediately and I store the other half of the sauce & tofu separately for another day. Just throw the chips, sauce, & tofu together for an almost instant 2nd serving. It is divine, restaurant quality (but better cause it’s at home). This is one of my faves, cannot rave about it enough. I made this last night, exactly as written (with good quality, store-bought tortilla chips), including the Mexican “cheese.” It was SO GOOD! My husband loved it, too! It’s a great Sunday night dinner–such comfort food! Thanks so much for sharing this, and all the other recipes you post! I made this today and it was the bomb! I can’t wait to make this a regular part of my weekend breakfast rotation. Thank you so much. I think your recipes look amazing I have not tried one yet but I will soon. I have a question on your cheese recipe. my husband is allergic to cashews can that ingredient be substituted? Hi Raquel! You could try macadamia nuts? 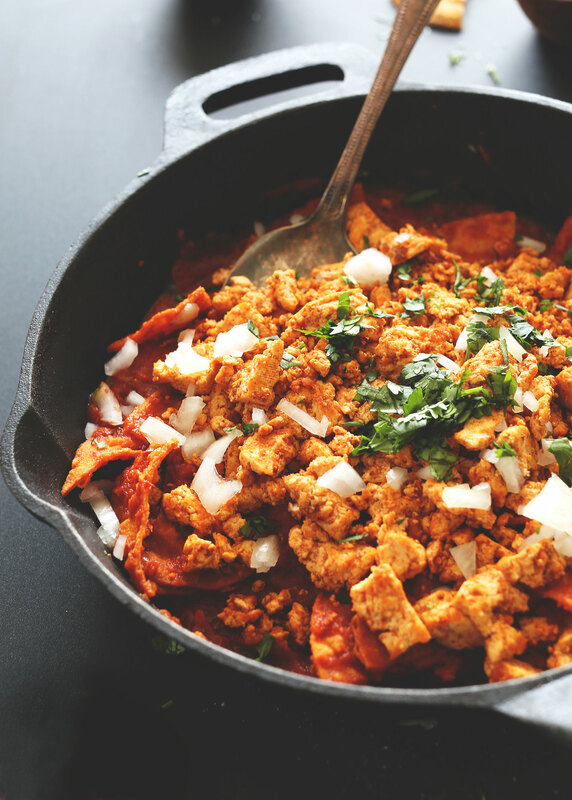 I made the CHIPOTLE TOFU CHILAQUILES tonight for dinner. I was cooking for 5 hungry people, so I decided to double the recipe. I added black beans to the sauce after it simmered, and let it simmer longer for a thicker sauce. I did not blend the sauce as we like it chunkier. Since all of us were unable to eat at the same time, I left everything deconstructed. Everyone assembled their own. Homemade chips, sauce, tofu, avocado, white onion, cilantro, Mexican cheese blend, and a quarter lime squeezed on top! To die for! Everything was gone… No leftovers? The only other thing that I would have done different was to make more tofu. I should have made one and a half packages but only made one. This recipe is a keeper! Thank You ? Holy moley! This is so spicy I’m such a baby..next time I will tweak this a bit. This has become a go-to for me on weeknights. I double the recipe, so I can have it all week (not combining the chips until I eat it). Another reason for doubling – I use the entire can of chipotle peppers. This makes it quite spicy, but I love it. This was amazing.My husband and I loved it.I never cooked mexican and I am not familiar with it.He, on the other hand had lots of Mexican food in Mexico City and said it was a real authentic “moma cooking ” taste.very impresses thank you for sharing this will be not the last time I made it..
I’ve been using your website for about 90% of my cooking over the last 2+ years. I own your cookbook and it’s my go-to. I expected this to just be an acceptable Mexican dish that was quick to make. I was absolutely blown away. This recipe was fantastic, and probably the best thing I’ve ever cooked. Thank you. I’ve made this for dinner and brunch a few times and even my 5 year old loves it. You definitely don’t miss the cheese in this recipe, which surprised me. Excellent! These were great! However, instead of using the recipe described here I used the leftover salsa I made using the CHIPOTLE RED SALSA recipe. The chips had a perfect crunch and the tofu was full of flavor. Thanks for sharing! I will be making these again. Just made these again and added black beans to the tofu mixture (you could easily sub black beans for the tofu). So good. Such nice constant heat from the chipotle in adobo. I even “made” the chips from corn tortillas…so good…I ate them fresh from the oven as I assembled the recipe (note to self: make a couple extra tortillas worth next time). Tip: you get the chipotle in adobo at your local Mexican grocery. This time, they had THREE brands! Tip2: If you don’t like heat, reeduce the amount of chipotle in adobo greatly-these babies are hot, ir skip that and add spice after with a hot sauce or salsa. I found this recipe in Mid-Nov 2016 when I was visiting my parents and trying to find something to fix for myself. It’s now the end of Jan 2017 and I’ve made it 5 times. I’ll make it once more this week. (So far, I’ve been making it twice to use up the chipotle peppers in adobe sauce). All I can say is WOW and thank you. This is so easy and I get faster each time I make it. So so good!! Added avocado because avocadoes are always a good idea. Next time I will make the entire block of tofu though, we easily could have eaten it all! Just made this for dinner and it was a great lower calorie meal! I don’t think my tomato sauce thickened enough (used diced tomatoes with juice) but using the immersion blender helped it be a bit more cohesive of a sauce. Only used half a chipotle as we’re babies when it comes to spice and it was the perfect amount of spice for us. Never would have thought to pan fry tofu but it was fantastic! I found it easier to crumble using my hands rather than a fork. Plan on making this again soon, but might leave the chips out and just put them on top, but other than that thanks for such an easy, protein packed meal! This was so so good! We loved it top with avocado and cilantro! Made this with a can of green chiles bc I didn’t have chipotle in adobo and it was incredibly delicious! 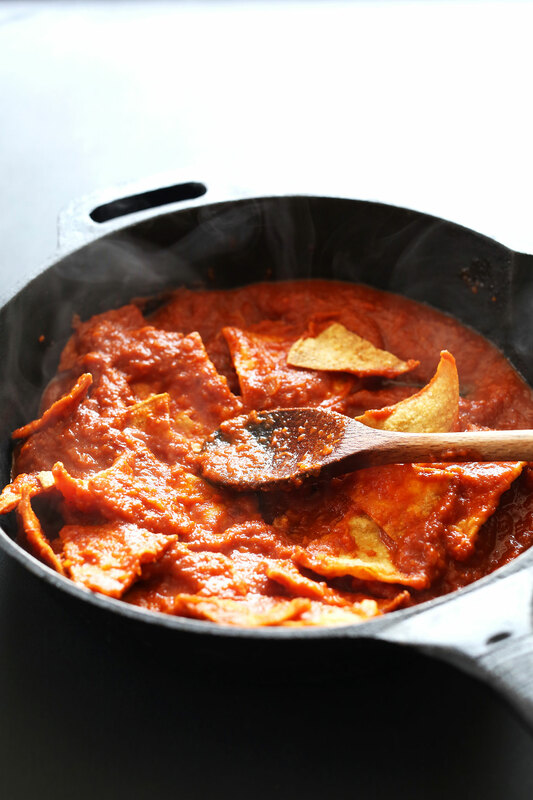 I love the texture of saucy, soaked tortilla chips with just a little crunch. The mexican parm on top w some extra white onion and lime juice really took it to the next level. Yay! Thanks for sharing that swap! Perfect food! I subbed a couple splashes of spicy pasta sauce (no canned tomato) and decided to skip blender use just adding tofu (and kidney beans for extra protein) To the “sauce” in pan. Turned out excellent anyway. Fresh made chips from tortilla so much better than regular old chips! Good recipe, although I dropped a few eggs in the skillet to top it off. I just made these for dinner. I can’t recommend this recipe enough! So simple and delicious! I’ve made this a couple times but am itching to try it with a chili verde sauce. Thanks Dana for all you and John do! Thank you for this recipe! It was amazing and a perfect vegan addition to our family Christmas brunch. We moved from Southern California two years ago, and I have been missing chilaquiles on menus as a staple item. I needed to serve 12 so I tweaked it a bit. I doubled the recipe; added 1 can black beans and 1 can of hominy; and I layered it in a glass baking dish so that it would go with the other items on the brunch table. My entire meat-eating family LOVED it! Delicious! Made for my vegan son who grew up eating homemade Mexican Red Chili and he loved it! It is different than my traditional Chili Colorado but very good! Pleased as usual! Your recipes help me prepare meals my son will eat and enjoy! Thank you! Ah, thanks Dolores! Glad you all enjoyed it! Hi Dana! About to make this for dinner… Question: No seasoning in the tomato sauce, as in salt? It’s tasting bland to me so, I’m going to add a tad. Also, I like a bit of spice but this is turning out to be too spicy if I want to finish a whole plate smothered in the sauce… and for my young kids to enjoy…so, for anyone interested I’d halve (or less) the chipotle. Thanks…cant wait to dig in! 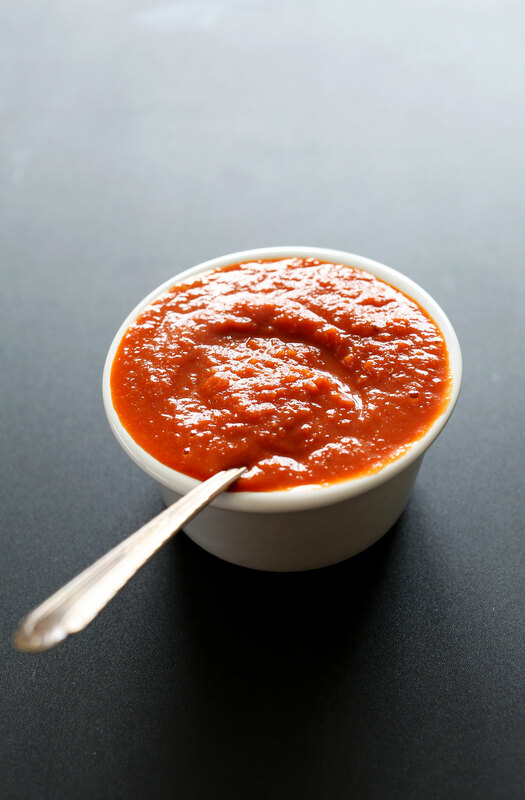 If the tomato sauce has salt, don’t add any additional salt before sampling first. But it sounds like you already figured it out! Hope you loved it, Angelica! This was a pretty good dinner to have on hand! I used mostly ingredients I had on hand (which is always good to do) and turned them into something I hadn’t tried before, which is what I like to do. I always have leftover tortillas lying around, and my boyfriend loves his nachos. This was a nice meeting point for my love of lighter, protein-rich vegan stuff and his love of vegan diner and junk food fare. I love it. I think I’ll start using this sauce on looooots of stuff now. Holy moly, these were amazing! Thank you for sharing, they were so tasty! I’m going to make them again in the near future, accompanied with the vegan queso (once I can get my hands on more raw cashews). This is my favorite of all your recipes! I tend to get tired of eating the same thing over & over, but not with this dish! The flavors are delicious – I make it every single week! Yay! Thanks so much for all the great recipes – you ROCK! Thank you for sharing this very delicious meal recipe. I now know what to prepare this weekend. Made These last night and was so satisfied by how easy and delicious they were! Cannot wait to do it again. Thank you! I have to admit I was a bit skeptical at first (I was raised on home cooked Mexican food) but since I LOVED your tofu stir fry recipe, I thought I would also give this a go. OMG. You did it again! My hubby and I loved this recipe as well! Thank you for the quality content! So great! Thanks for sharing, Jessica! Made this for me and my 4-year old twins and two of us loved it!! (My son doesn’t like anything that doesn’t contain chocolate so I still think this recipe rocks!) I didn’t have chipotle so I skipped it and used fire roasted tomatoes. I will be making it again this week. Can’t wait! Just made this- AWESOME! I used less chipotle than suggested because its really spicy. Topped it with avocado with fresh lime juice. Love this site! Yay! Thanks for sharing, Amelia! DUDE! This was AWESOME! HOW awesome? Well, my 2, very picky kids (9 and almost 6) liked it!!! And the hubster! And me, of course :) Thank you for helping us with an awesome, vegan meal!!! This looks fantastic! 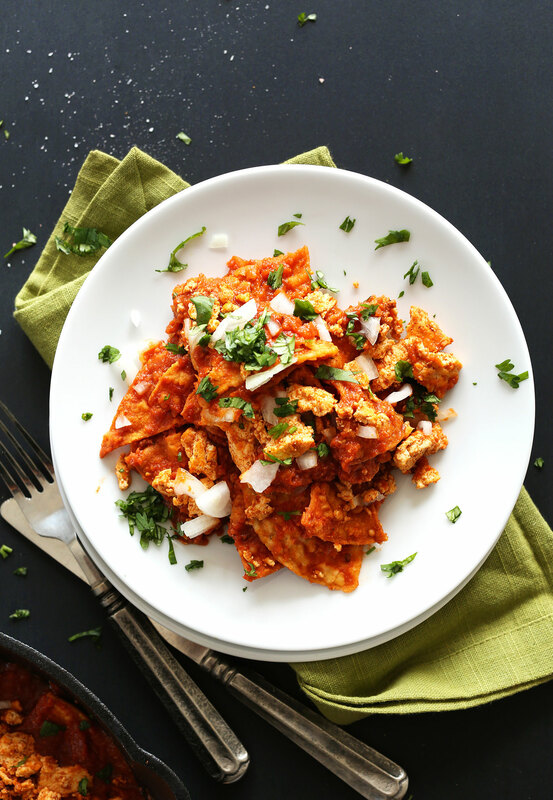 My husband loves chilaquiles so I’ll have to recreate this for him, thanks for sharing! Wow- flavor explosion!!!! I added 1 tbsp of nutritional yeast to the tofu. Definitely making this again!!!! Oh my god this and your vegan Mexican cheese is fantastic!! I just made it for me and the SO and it was so good! I couldn’t believe how amazing the vegan cheese was! I was never willing to give it the benefit of the doubt, but I’m really glad I did. Maybe next time I’ll make my own corn chips to go with it! Simply brilliant! I had never tried this dish before and I made my own chips plus the cheese and I love it! It’s the perfect dish for the rainy and gloomy weather we have here in Finland right now. Thank you!! Finland? Jealous! Hope you love this dish! Just made this and am wolfing it down as I speak. I’ve never heard of chilaquiles before, but these are delicious! They remind me of a similar Mexican food-inspired casserole my Mom used to make for us as kids. Amazing! I substituted the chipotle in adobo for a can of El Pato sauce and chipotle chili powder, because that is what I had on hand. Super yummy! Yay! Glad you enjoyed it, Inez! Just made these! OMG so, so good! I have to say… I definitely needed some cheese and sour cream to cut the spice in the dish! My nose is still running! I used a whole block of tofu and baked 6 tortillas, hoping to bake more tortillas tomorrow and get 2 more servings. That being said, my nutrition content is way different (418 calories, 14g fat, 26g protein) but I’m not complaining because we made it for dinner and I am definitely stuffed! This is the 4th recipe of yours I’ve made and I’ve loved each and every one! Thank you! I made this last night for dinner. It was SO good. I used an entire block of lite firm tofu and 1/3 of the recipe is very filling! I’m having another serving for lunch! 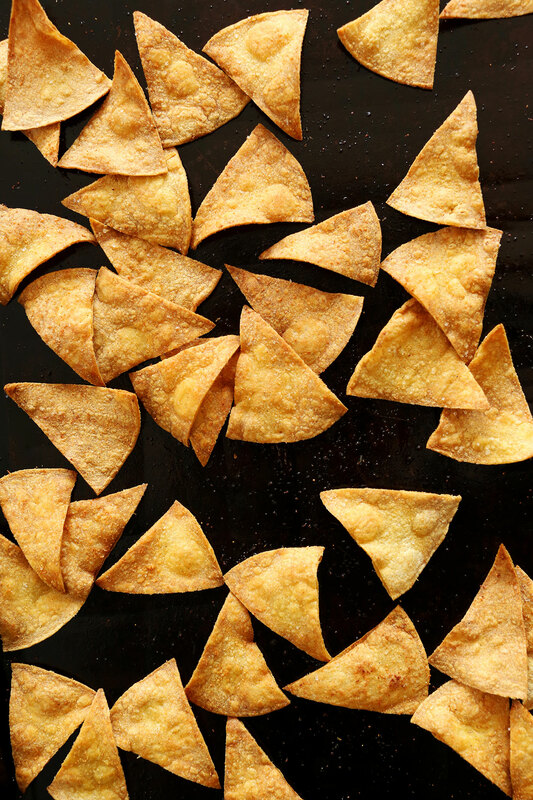 Just a side note – the corn chips get soggy. This doesn’t bother me but if you think it would bother you then you could leave them out and use them to scoop up the tofu/sauce instead of mixing them in (my boyfriend would have preferred that). Thank you for the great recipes! I have loved everything that I have made from your site! Great tip. Yeah, they don’t reheat well the next day so it’s best to keep them separate if not serving all at once. Thanks for sharing, Anna! My husband is Mexican and I not only fell in love with him, but also with his Chilaquiles. Yum! And then…I switched to being vegan. I only pouted a little when I watched him and the kids eat Chilaquiles for breakfast while I made myself something else. I was happy for them, right? And now…and now your recipe comes to my rescue!! I was quick to show him and quick to print out the recipe. Thank you! Today is our 8th wedding anniversary, so I’m sure he’ll be pleased to make this for dinner. ( : Right Honey? Thank you ! Made tonight and my husband and I devoured it. Topped with a heaping spoonful of guacamole to cut through the heat. Yay! So glad you both enjoyed it. Thanks for sharing, Lisa! I have always loved Chilaquiles since I was a little girl. I haven’t eaten any in a while since I turned semi-vegan. Now I can eat some and it’s vegan! Thank you! Of course! Hope you give them a try! This looks DELICIOUS! I don’t know if I’ve ever had chilaquiles, actually… oops. Well, now I have a good excuse to try them! I didn’t know that chilaquiles existed until a few years ago either and I still have never tried them! I’m not sure what is wrong with me, haha! I love the addition of the tofu and those chips look great! Thank you for reminding me how much I need to have chilaquiles in my life! WHAT. This looks amazing! Can’t do tofu, but I will definitely have to try this with chicken or beef :) Thank you so much for sharing! Thank you for a wonderful breakfast ! These were DELICIOUS! I saw chilaquiles for the first time on The Kitchen a few weeks ago. I had never heard of them before but instantly wanted to try them. Thanks for conveniently coming out with this recipe at the right time. I will be adding it to my rotation! I just made this for my boyfriend and I. SO good. We were able to rejuvenate some stale tortilla chips by baking them in the oven during the make your own tortilla chips phase you described above. The sauce… what can I say about the sauce. It was amazing with a nice and thick consistency. We had more sauce then our chips so we are saving the leftovers for breakfast burritos this week! Great recipe. Thanks for sharing! This looks amazing. I’ve never had a chilaquiles before. But I’m ready to dive right in! Yum! Love that you veganized it Dana!! I haven’t heard of anything like this before, but I definitely need this in my life. Holy yum! I seriously can’t wait to try this recipe out! I’ve actually never had chilaquiles! This looks like a great vegan twist! I looooove chilaquiles! I basically try to eat them for every meal when I’m in Mexico (which is not very often the past few years. Sad.) Wouldn’t have thought to ditch the egg and cheese for tofu… but I like it! Such a spicy and delicious way to start the day! Or to just have whenever. I love this fun adaptation of the traditional version. Looks fantastic!